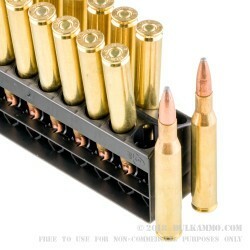 When it comes to hunting dangerous game, being underprepared can often be just as dangerous as being unarmed. With the Remington .270 130 grain Pointed Soft Point, never again will you have to worry again about being underpowered, even on the most ferocious of hunts. With the Remington .270 130gr Pointed Soft Point, hunting across vast terrains, harsh climates, and inclimate weather will never again be the reason you are unable to take a confident shot. Engineered around Remington’s patented Pointed Soft Point Technology, the Remington .270 130gr PSP is a aerodynamically sound as it is deadly. 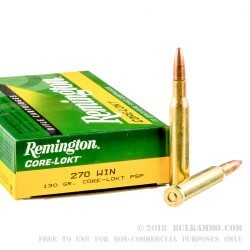 Capable of expanding out to nearly 2.5 times its original diameter upon impact, the Remington .270 130gr PSP delivers a violent wound cavity that is capable of humanely killing most medium sized game in within a single shot. 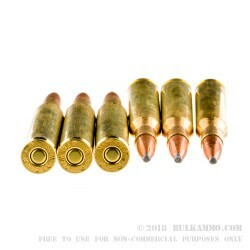 WIth bullet velocities pushing the envelope upwards of 3,060 feet per second at the muzzle, tthe Remington .270 130gr PSP is also capable of delivery a degree of hydrostatic shock unparalleled compared against other slower rifle rounds. Hunters and extreme long distance shooting enthusiasts looking for a round that defies all traditional boundaries may never again choose to take another round on their most important hunts than the Remington .270 130gr Pointed Soft Point.